Murad Resurgence is the answer for hormonally aging skin developed by world renowned dermatologist, Dr. Howard Murad. It is for real women and delivers real results. Resurgence can give you younger looking skin in just 30 days. It has been clinically proven to help hormonally aging skin look younger in 3 simple steps. The first part of the system is the Renewing Cleansing Cream. It helps improve the skin’s appearance by gently exfoliating to restore radiance and protect the skin’s natural moisture barrier. Next is the Age Diffusing Serum that is concentrated on firming and toning the skin. It prevents collagen breakdown and improves skin elasticity to reduce the appearance of wrinkles and sagging skin. The last step is the Age Balancing Night Cream. It Rejuvenates the skin and minimizes the appearance of pores by hydrating and helping restore suppleness. 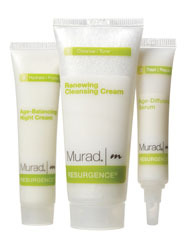 When you order Murad Resurgence now for $39.95 plus shipping and handling, you also receive a set of free bonus gifts. It includes Murad’s Renewing Eye Cream, Acne Spot Treatment, Sheer Lustre Day Moisture with SPF 15, and Dr. Murad’s 16-page Skin Health Guide. Plus you get a free upgrade to priority shipping.